Moral Landscape in a Sichuan Mountain Village explores the histories, beliefs, livelihoods, and local identities in Xiakou (sha-ko) Village, located in the mountains of Ya'an County, in western Sichuan Province of the People's Republic of China. The ethnography is a joint effort of a historian (John Flower) and an anthropologist (Pamela Leonard), and is based on the extensive fieldwork research we have carried out in the area since 1991. Our goal is to understand Xiakou Village as an evolving moral landscape, defined as the interwoven field of physical environment, historical memory, and moral agency in which people interact with place. This approach builds on the villagers idea that the natural order and the moral order are fundamentally linked; therefore, we look at the landscape of the village as at once a resource for economic production, a metaphor for social relations, and an inscription of historical memory. By asking how particular places gather a people's sense of themselves, the ethnography reveals how issues of environment, development, and local history are connected at the grassroots level in the Chinese countryside. This project is also a digital ethnography that explores new ways of presenting a body of research in digital form, online. The digital ethnography is an interactive presentation of focused, long-term fieldwork research results in the form of an online monograph, media archive, a relational database, and GIS mapping. 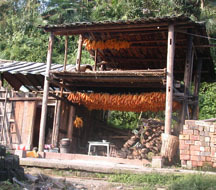 Our aim is to use the project's digital form to reinforce its ethnographic content, using new technologies to render more transparent the relationship between source and interpretation, to open up non-linear narrative paths through the ethnography, and therefore to more vividly reveal the interconnections among different dimensions of village life that are the core content of the project. The ethnography's narrative is presented in six thematic chapters--History, Landscape, Belief, Folklife, Authority, and Work. Chapters are not airtight divisions, but rather groupings that highlight the dominant themes of the essays within them. There are three main types of content within this chapter structure: essays, interactive maps, and artifacts. Essays are the basic interpretive building blocks of the ethnography and are accessed through the chapters. The interactive maps under Places offer spatial representations of sites in the cultural landscape, dynamically presented through GIS layers, sorted by kind and historical period. Both the maps and essays are illustrated and documented by Artifacts, which appear as icons (in the case of maps) or thumbnail graphics (in the case of essays) linked to multimedia contentâ€”photographs, video and audio recordings, image maps, diagrams, supplemental texts, primary source documents, and field notes. The artifact frames this multimedia content within supplementary fields, including description, transcription, translation, analysis, and in relation to particular places, people, features, texts, and events. Artifacts float free of chapters and essaysâ€”they may be referenced by one or more essays or they may have no special associations, but they serve as a flexible narrative tissue linking essays and artifacts together, and they highlight thematic overlaps and interconnections within the ethnography. The essay/artifact structure allows us to experiment with different approaches to conceptualizing and presenting the ethnographic research. For readers who want to engage the ethnography more interactively, we have assigned keywords to the media objects, features, people, texts, and essay subsections, enabling readers to Search the whole site through the database. In addition, there are coordinating pages that help readers sort information on the People who appear in the ethnography, the Document content of the website, and Timelines of events referenced in the ethnography. In the future, the Resources section will provide specific aids for using this website as a teaching tool. What is a village in China? A wide range of scholarship has addressed this central question, from the perspectives of regional systems analysis (Skinner 1964) to cultural landscape studies (Knapp 1992, Feuchtwang 1997). Our approach tries to give priority to villagers' conscious representations, analyses, and understandings of their relationship to "their place." 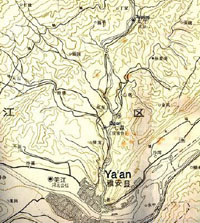 The resulting geographical scope goes beyond the village itself to encompass the communities along the North Road, running through an upland valley forty kilometers from the county seat of Ya'an to the White Horse Temple, and, under some conditions, extends to include the broader eight county Ya'an region. Within these geographical parameters, our project addresses the issue of attachment to place and identity formation, exploring sites of interaction and memory common to the villagers beyond administrative boundaries. These sites, vividly presented through an archive of multimedia artifacts, are the source materials through which our project aims to more precisely define and understand the landscape of the village. Another fundamental goal of our project's landscape approach is to reframe modern Chinese history away from the master narrative of the nation and toward local stories of the grassroots. (Duara 1995, Prazniak 1999, Bianco 2001). How do the villagers of Xiakou understand their history? What memories and meanings from the past still animate their place, and how are they remembered and explained? How does that local understanding of history reiterate or differ from historical narratives based on the nation-state, China, as subject? While there are excellent village-based histories (e.g. Chan et al 1992, Friedman et al 1991, Potter and Potter 1990) that focus on the local impact of national events, particularly the Chinese revolution, in Moral Landscape in a Sichuan Mountain Village we try to adopt a more localized, inductive approach. The historical scope of our project thus largely corresponds to the way villagers mark the turning points in their past, based on their personal experiences in local places and marking events that fall within their horizon of memory. Our primary goal is not to attempt an "objective reconstruction" of local history, but rather to explore historical memory and to suggest the continued relevance of the past in lived experience of the present (R. Watson 1994, Jing 1996, Muegglar 2001). The historical sources for the project's essays and artifacts are oral histories drawn from interviews with older residents of the village; information found in the gazetteers of Ya'an county (xianzhi 1924, 1938, 1993), Yazhou prefecture (fuzhi 1739), as well as the old and new gazetteers of surrounding counties in the Ya'an region; and local texts such as family genealogies, and tomb, temple, and monument inscriptions. People in Xiakou see their relationship to the land--their "landscape"--both through and on their experience of history: through history, in that patterns of encountering the landscape represent a specific response to historical change, and on history, in that historical memory is the expression of changing values. We interpret the landscape, then, through a consideration of historical memory in Xiakou. But because the resources in that landscape are themselves part of the material conditions of production, the way in which they are managed is much more than a metaphor; the management of the landscape has a real bearing on the course of social reproduction itself. In other words, landscape is not simply a passive reflection of changing political economies, but rather an active factor shaping domestic practices and the ecology of village life. Changes in the landscape are both emblem and agent of change, and have emerged as a core site for contested aspirations and imaginings of rural China. The story of Moral Landscape in a Sichuan Mountain Village is the dramatic transformation of the village's social and physical environment, primarily over the course of the past century. At the horizon of villagers' memories are stories of the warfare and chaos in the republican period (1930s and 1940s), during which older networks with their landed gentry, imperial connections, and protective peasant associations were reworked into new power relations based on national military networks, local secret societies, banditry, guns, and opium. With the coming of the revolution, we explore the ways in which the national objectives of the Maoist program articulated and conflicted with local interests and local desires for social change. The new regime successfully addressed what villagers perceived as the state's moral obligations for basic infrastructure development, but the extreme centralization of power revolutionized agricultural production with disastrous results: nearly half the population of the village died in the early 1960s during the famine following the mass collectivization of the Great Leap Forward. After 1981, the second land reform re-introduced family-based production in a new context of fast-paced changes associated with China's integration into the global economy. Throughout this period, the village and its broader region have undergone truly radical environmental changes. Before 1949, the North Road was just a footpath, and the upland river valley still held rich stands of timber and abundant wildlife, from man-eating leopards to over twenty varieties of edible fish. By the early 1990s, the forest cover and wild animals had all but completely vanished, the rivers had been mined of their stone resources, the soil was thin and dependent on chemical inputs, the steep hillsides were prone to erosion, and new sources of pollution threatened basic water resources. Changes over the last few years have been particularly far reaching, with massive dam projects to generate electricity for the national power grid, and development policies that have redefined this region an "ecological zone" in which farming is being replaced by reforestation, eco-tourism, and wage labor. In trying to understand the significance of the environmental changes that have taken place in this valley, we frame issues of environment and economic development within local cultural practices and historical knowledge. How do local people draw on their historical understanding of place in adapting to economic development policies introduced from outside? How do those development policies in turn influence their livelihoods, and change their understanding of the landscape? The digital ethnography's research on the understanding of place focuses on the meanings local people have ascribed to and inscribed in their landscape; thus we analyze stone monuments, tombs, temple stele, shrines, bridges, road markers, as well as soil, waterways, and "fengshui trees" as concrete texts embodying local knowledge and expressing moral values. Landscape, then, is more than the physical setting of development; it speaks to development discourse by disclosing the complexity of local self-understandings enacted and gathered in place.